"A comprehensive core routine includes strengthening and flexibility training for the lower back, buttocks, hamstrings and the abdomen; an incomplete routine leaves the spine vulnerable to injury." 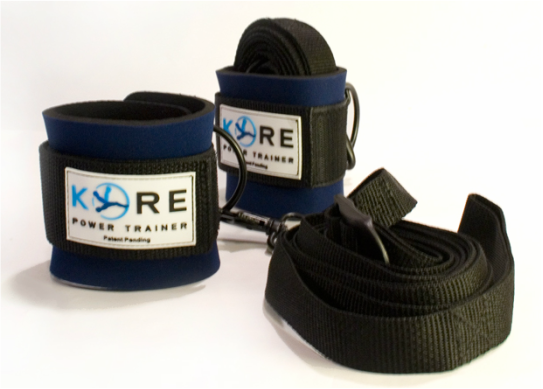 What is the Kore Power Trainer? For nearly 20 years I trained my lower back pain patients in a floor routine to strengthen their core and improve flexibility. Like taking a yoga or Pilates class, the floor routine was wonderful but long and it required a lot of dedication (at least 30 minutes, 3-5 times per week). Those patients who did the routine got better faster and more completely than those who did not because a strong and flexible core relieves pressure on the spine and helps prevent recurrent strain injuries. I knew that if everyone would train their core properly the lower back pain epidemic in this country could end. I also knew that most people didn't have time in their busy lives for that level of commitment. 30-40 minutes 3-5 times per week is a lot to ask! When in the grips of back pain, we will do almost anything to get well, but once the pain is gone we tend to forget about our backs. The Kore Power Trainer (KPT) was invented to solve this problem. A simple, durable, high-quality device which attaches to your bed, the KPT enables anyone to train their core better than 30-40 minutes of floor exercises in just 4 minutes. You need no other equipment, no extra room in your home, and no big time commitment. You do not have to drive to an exercise studio or even change your clothes. What's more KPT has a tiny footprint: it can be stored under the bed, completely out of sight. KPT utilizes the principle of Peak Gravity Resistance to make training the core go fast. As opposed to standard abdominal exercises like sit-ups or crunches, where we move our torsos back and forth, with KPT the movement is up and down against gravity. By working directly against gravity we dramatically increase the resistance encountered during each repetition causing muscles to work much harder and to fatigue much more quickly. Working muscles to fatigue is what increases their strength, so the faster a particular exercise fatigues a muscle, the more efficient it is. I used to have to do close to 200 crunches on the floor to feel a burn in my abs. Now, using KPT, I feel that burn after just a few reps. Once each day I simply hook my ankles into the cuffs, shimmy back to the edge of my bed, and spend one minute working my front, one minute working my right side, one minute working my lower back and buttock muscles, and one minute working my left side. I call it "going around the clock," and my core workout is over in 4 minutes. In my 50's I have a stronger, tighter core than I did in my 20's and my lower back feels great. Want to cut down on doctor visits for back pain? Want to know what it feels like to wake up without pain? Can you remember a time when your mid-section looked great and felt great? Consider 4 minutes a day on the Kore Power Trainer. I practice what I preach and stand behind this revolutionarily simple device and core training technique.